"The action and words in Bangalore have caught the attention of law makers in the United States. This was possible because Variety, one of most influential film journals in the world published from California, carried a news report in its edition dated August 19 — ‘Foreign pics face seven-week delay’. “The article has caught the attention of California’s legislature,” says Dhananjay. The article has reportedly been included in the long list of documents collected by California legislators to justify their Bill to ban outsourcing. Apparently, they are seeking to justify their ban on outsourcing to India by citing Indian restrictions on the screening of Hollywood movies." Anand Rao Circle has earned the dubious distinction for not only being one of the most congested traffic junctions but also the most polluted one in the central business district of Bangalore. Situated in the heart of the city, an estimated 18,000 vehicles (passenger car unit) pass through this junction every hour as it acts as the gateway for vehicles moving towards southern and eastern parts of Bangalore. Also, it is the only junction in the City where most Bangalore Metropolitan Transport Corporation (BMTC) buses pass through. With the entire traffic in Sheshadripuram diverted towards this junction recently, due to the ongoing project to construct an extra carriage way near the railway under-bridge in Nehrunagar, the density of traffic on this junction has increased manifold. instance, the one-way traffic introduced on Subedar Chattram (SC) Road has drawn flak. Nor has there been any relief for motorists after the BMP remodelled the junction. “One-ways here have only succeeded in making roads in the junction unsafe, as motorists drive at high speed,” shop owners near the junction complained. Despite traffic chaos, private bus operators have continued to flourish and they park buses right on the busy roads. Private buses block traffic on Sheshadri Road, S R Road and Race Course Road, especially during evening. Moreover, hundreds of commuters travelling in private buses congregate at this junction, causing traffic jams. Surprisingly, traffic policemen manning the junction always turn a blind eye to this problem. Even as BDA is conducting studies on the feasibility of a flyover here, questions have been raised on the utility of such a structure. Construction of mini-flyovers (pass overs) near all congested junctions --as planned by BMP and BDA -- will only lead to chaos as it will increase the speed of vehicles, traffic experts fear. Instead, experts suggest, BDA should construct a flyover, connecting several junctions at a stretch. In other words, the proposed flyover should connect Khoday Circle, Anand Rao Circle and K R Circle. nDiverting traffic as much as possible. nWidening of all roads connecting this junction. We invite our readers to suggest ways of overcoming the traffic snarls. You may e-mail your suggestions to editordh@deccanherald. There is an increase in speed of vehicles after the introduction of a one-way on Sheshadri Road and SC Road, while the condition of roads have turned bad to worse. No project will be of any use unless traffic flow is diverted to other areas. It is high time to implement dedicated lane systems, especially at junctions like Anand Rao Circle and K R Circle. Traffic gets mixed up, leading to congestion. Dedicated lanes will not only bring in traffic discipline but also bring down the accident rate. Private buses operators should be shifted from this junction. This, if done, will prevent a large number of people coming towards this junction and ease congestion. Neither the flyover nor an underpass will be a solution for this problem. While there has been a steady increase in traffic density, all roads connected to this junction have remained narrow for many years, which has led to congestion. All roads should be widened, besides banning commercial activities near this junction. All government offices located near the junction should be shifted to other places, paving the way for widening of existing roads. This will be a huge relief, especially during peak hours. Is the entire Governance structure in this country geared only for the benefit of a particularly special variety of scum that inhabits this earth , our politicians? Bangalore Aug. 30. The Cabinet today adopted a tough posture against Jayakar Jerome, former Commissioner of the Bangalore Development Authority (BDA) and Secretary, Minority Welfare, who said he would sue former Prime Minister H.D. Deve Gowda. It empowered the Chief Minister, N. Dharam Singh, to take appropriate action against him for "violation of the Civil Services rules of conduct." The Minister for Revenue, M.P. Prakash, told presspersons that the Law Department was looking into the statements of Mr. Jerome. Civil servants making statements against individuals in the media and appearing on television amounted to violation of rules. Mr. Jerome had sought permission from the Chief Secretary, K.K. Misra, to file a defamation suit against Mr. Deve Gowda who had levelled charges against him with regard to land dealings involving the BDA. Earlier, the Chief Minister disapproved of Mr. Jerome's statement. The Lok Adalat has directed the BMP and LDA to submit a report about the possible impacts of a proposed building by Mantri Developers. The Karnataka Lok Adalat has directed the State government to submit a report on what would be the effect on Sankey tank if the construction of a proposed multi-storeyed building on the tank-bed area is allowed. A Bench comprising Justice P Vishwanatha Shetty of Karnataka High Court and Mr Yellappa Reddy directed the Lake Development Authority, the Bangalore Mahanagara Palike and other government agencies concerned to submit a report to the Adalat by September 8. The Adalat was hearing the petitions questioning the construction of a proposed multi-storeyed building by M/s Mantri Developers for the M/s Gulf Oil Corporation Limited on the tank-bed area. The Adalat has also asked the authorities to submit a report on the status of the land on which the proposed building has to be constructed. During the hearing on the petition, the BMP has informed the Adalat that it had not sanctioned any plan for the proposed building. The BMP has also stated that it had directed M/s Mantri Developers to obtain a no objection certificate from the Ministry of Environment and Forests for the proposed project. The BMP has also made it clear that it would take immediate action if attempts were made to construct any structure on the tank-bed area without obtaining permission from the authorities concerned. The petitions before the Lok Adalat have alleged that construction of a building would cause water pollution and would deplete the ground water table. The controversy surrounding the State Government’s decision to defer the release of non-Kannada films for seven weeks witnessed another negative spin - 47 more theatres in Bangalore have resolved to stop screening movies from Tuesday. The decision was announced on Monday by the Karnataka Cinema Theatre Owners’ Association, which is protesting against the government’s decision. The theatres which have decided to close are: Plaza, Majestic, Ajanta, Apsara, Mahadeshwaraa, Maheshwari, Eswari, Kamakya, Laxmi, Sreenivasa, Thirumala, Sandeep, Ganesh, Abhiman, Anand, Anjan, Aruna, Elgin, Everest, Gopal, Keshava, Krishna, Mukunda, Narasimha, Pallavi, Poornima, Rajeshwari, Ranganatha, Renuka, Savitha, Sharada, Shoba, Tulsi, Vijayalakshmi, Vinayaka, Prithvi, Vijay, Balaji (Chikkasandra), Rajashekar, Shiva, Pushpanjali (Shivanahalli), Pushpanjali (Sultanpalya), Amruth, Meenaxi (KGF) and Rajeshwari (HAL). With this, the total number of theatres that have stopped screening films are 68. Theatres in Bellary district, which generate more revenue from Telugu movies, have threatened to close if the government fails to revoke its decision by Friday. However, the Kannada Film Producers’ Association, which apparently pressurised the Government to defer the release of non-Kannada movies, said it would not budge over its stand. Speaking to Deccan Herald, Kannada Film Producers’ Association, President Basanth Kumar Patil said he finds no reason as to why the exhibitors should object to defer the release of non-Kannada films. “Those affected by the decision, would be the distributors themselves who would have bought the film. But when they have agreed for the deferred release, why should the exhibitors make a hue and cry over the issue?” Mr Patil asked. The theatres which are complaining are those which have not patronised Kannada, these just want to draw the attention of the government, he said. “Why don’t these theatres patronise Kannada movies, instead?,” he asked. Meanwhile, the president of the Karnataka Film Chamber of Commerce S Ramesh, said that they are holding meetings with the Kannada film producers and the exhibitors. He said a final decision would be taken on Tuesday. If you live in Bangalore and drive around, you would have doubtlessly experienced people jumping traffic lights. Even as the red signal is counting down to a changeover to green, traffic jumps the signal a full 10-15 counts ahead of time. The biggest violators are BMTC buses and autorickshaws. But the most most shameless transgressors are educated, well-heeled people driving around in swank cars. If you happen to be among the unfortunate few law-abiding motorists who patiently wait for the signal to turn green, you will become the target of abuses by those who want to blatantly jump the signal, for not making way for them. Sadly, traffic constables remain silent bystanders. This must be the only country where law abiding citizens are subjected to indiginity while those in the breach of it get away scot free. If there is one lesson I have learnt, it is that it does not pay to play by the rules in this land. Mysore Bank Circle has become synonymous with protests. Not less than 5 to 10 protests are staged at this circle in a month causing undue hardship to commuters. Protests notwithstanding, lack of lane discipline affects peak hour traffic at this junction. Despite KG Road being made a one-way from Hudson Circle, the voluminous traffic has become a nightmare for traffic police and the commuters. 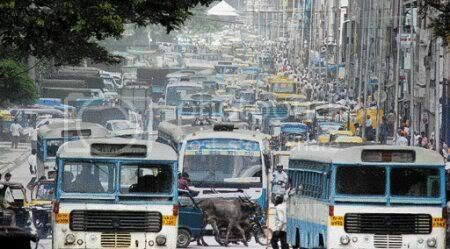 Nearly 10,000 vehicles pass through the Mysore Bank circle every hour. A single protest is enough to throw peak hour traffic out of gear not just at this Circle but at Anand Rao Circle, K R Circle and Hudson Circle. This Circle connects four major roads -Avenue Road, Post Office Road, Palace Road and KG Road. It also acts as an entry point for vehicles to reach the KSRTC, BMTC bus station and City Railway Station. From Hudson Circle to Mysore Bank circle, the width of the road is 75-feet and thereafter the road is just 40-feet until Upparpet Police station adding to the mounting traffic. To top it all, there is no lane discipline and there is haphazard pedestrian movement near the traffic signal adding to the chaos at the circle. When contacted the police authorities said the flow of traffic is smooth throughout the day except during peak hours. Processions should be banned near the Circle as it affects vehicular movement, a traffic police constable manning the traffic at the circle said. In fact, the traffic policemen dread to man traffic during peak hours. Adding to the woes is the poor state of infrastructure, which has remained static for decades despite an increase in the traffic flow. The traffic is enormous between 9 am and 11 am and between 4 pm to 8 pm. According to Assistant Commissioner of Police (Traffic-West) Mohammed Rafiq A Mulla, a flyover is essential for easing congestion at the circle. On enforcing lane discipline on KG Road, he said that police will try to enforce it, but the motorists are not disciplined. We invite our readers to suggest ways of overcoming the traffic snarls. You may e-mail your suggestions to editordh@deccanherald.co.in or snail mail to 75, M G Road, Bangalore-560001. -Synchronisation of traffic signals from Town Hall to Mysore Bank Circle is essential to reduce congestion. Staggered working hours for Government offices will help in better traffic management. -Introduction of one-way from Maharani’s college junction to Mysore Bank is not a wise decision. Several office-goers who travel by BMTC buses have no other option but to take a long circuitous route to reach their offices. -A flyover or an underpass is essential at Mysore Bank circle. Otherwise, traffic congestion will continue to increase by the day. Strict enforcement of traffic rules is essential to ensure smooth movement of vehicles. -BMTC buses should be allowed on Palace Road till Mysore Bank Circle from Maharani’s College junction. Office-goers have been severely affected due to introduction of one-way between Maharani’s College and Mysore Bank Circle. -One-way is not the solution for reducing traffic congestion. In fact, it has resulted in more congestion in and around Mysore Bank circle, causing wastage of fuel and high pollution. The police should strictly enforce lane discipline and streamline pedestrian movement. -Pedestrian subway is necessary for ensuring smooth pedestrian movement. Crossing the busy circle is a difficult task for pedestrians in the absence of a subway. The BJP led by its top honchos Vajpayee and Advani plans to hold a one week long Satyagraha in Bangalore to demand the release of Uma Bharti, from the 1st of September. This is all that was missing in the chaos in the city. With even an obscure ABVP called bundh yesterday seeing the torching of buses and ransacking of shops, expect lots of violence and disruption in life next week. As much as 90 pc of the entertainment tax comes from Bangalore. And bulk of this amount comes from just 12 theatres which will stop screening. Hemmed in by the State government’s new entertainment policy and the film-goers’ dwindling interest, a total of 21 film theatres including the Innovative Multiplex in Bangalore City have resolved to stop screening from August 30. The decision on not to screen, announced on Saturday by the Karnataka Cinema Theatre Owners’ Association, comes in the backdrop of the State government’s decision to defer release of non-Kannada films for seven weeks. “We have not been allowed to screen new non-Kannada films and movie-goers are not interested in seeing old films. With the theatre occupancy rate reduced to a mere six per cent now, the only way out for us is to close the theatres and wait till the government reconsiders its decision,” a member of the association told Deccan Herald. The theatres that have decided to suspend screening indefinitely are Symphony, Rex, Abhinay, Kailash, Tribhuvan, Menaka, Urvashi, Cauvery, Naga, Nataraj, Sampige, Vaibhav, Lavanya, Sri Balaji, Parimala, Pradeep, Pushpanjali, Radhakrishna, Sangeet and Movieland. The list also comprises 12 theatres which top the list of revenue-earners in the State. “The State government earns about Rs 33 crore per annum as entertainment tax and 90 per cent of the collections generate from Bangalore alone. Some of the movies that had generated a lot of hype but did not hit the Bangalore silverscreen on Friday were the Hollywood flick Anaconda - 2, Hindi films Dhoom and Phir Milenge and the Tamil film Madurai. The movies, which Bangaloreans will miss out in September include Manoj ‘Nigh’ Shyamalan’s The Village. The worst hit by the seven-week delayed release are the multiplexes that have come up in the City in recent times. “If only Kannada movies are screened at the multiplexes, all the halls would be virtually empty if one were to go by the City’s cosmopolitan outlook,” a distributor said. The Theatre Owners’ Association said the 21 theatres would not screen any movie till the government revokes its decision. Symphony, Rex, Abhinay, Kailash, Tribhuvan, Menaka, Urvashi, Cauvery, Naga, Nataraj, Sampige, Vaibhav, Lavanya, Sri Balaji, Parimala, Pradeep, Pushpanjali, Radhakrishna, Sangeet and Movieland. The former chief of the BDA feels that the JD(S) supremo has in his letter indulged in “defamation of the worst kind”. Senior IAS officer Jayakar Jerome has decided to wage a legal battle against former prime minister and JD(S) President H D Deve Gowda for his “allegations” against Bangalore Development Authority (BDA) during Mr Jerome’s tenure as commissioner. Secretariat sources said that Mr Jerome, now serving as Secretary, Minorities Welfare Department, had written to Chief Secretary K K Misra seeking permission to prosecute Mr Gowda “in appropriate criminal and civil courts”. In his August 16 letter, Mr Jerome said: “I have functioned as the Commissioner of BDA from October 25, 1999 to July 28, 2004. The turnaround of the BDA during this period has not only been written about extensively but is there for all to see and experience. Notwithstanding all this, it is most unfortunate that I have by name been singled out for defamation of the worst kind. Mr Jerome said silence on his part would “give rise to suspicion of” his integrity and character. “Therefore, I have no option but to vindicate myself. In the present circumstances, this can only be done in a court of law. I therefore request permission of the government under Rule 17 of the All-India Service Conduct Rules to prosecute Mr Gowda in appropriate criminal and civil courts,” he said in his letter. Interestingly, former chief minister S M Krishna in his letter to Chief Minister N Dharam Singh, had given a comparative performance of the BDA during his tenure. Mr Krishna had said Mr Gowda’s 29-page letter to Mr Singh contained “wild and baseless allegations”. History stands swamped in anarchy at this traffic junction where vehicles whizz past at break-neck speed often straying on to narrow pedestrian pathways, traffic lights turn on and off abruptly and manual management of traffic only adds to the confusion. Getting past Town Hall junction in the midst of the City is a nightmare. Hub of one of the busiest areas of the City, the Town Hall junction comprises two intersections. The JC Road stretch from Minerva Circle, NR Road, SJP Road and the JC Road stretch leading to BMP office intersect at the first of the Town Hall intersections. The second intersection brings together the JC Road stretch from Town Hall, Nrupathunga Road, Mission Road and the JC Road stretch leading to Hudson Circle. Corporation office, LIC and Canara Bank, Dasappa Maternity Home, Ravindra Kalakshetra, Badami House housing KSTDC office, Town Hall and Unity Buildings are the landmarks that form the periphery of the junction overlooking which stands the statue of Bangalore’s founder Kempe Gowda, in a BMP park. The Town Hall junction is busy throughout the day. As drivers of speeding vehicles try to make sense of the labyrinthine roads, pedestrians court death at every step as they move from one side of the road to the other. Two policemen, each on two shifts at each intersection have been able to do little to contain the chaos. Police say, 12,000 vehicles drive past the Town Hall junction every hour. The ideal number is only 8,000. Vehicles coming from Kalasipalyam and Mysore Road have been diverted into Pehelwan Krishna Road and only BMTC buses are allowed into the Town Hall junction. Mr M A Saleem, DCP (East Zone), said this has eased more than 30 per cent of the congestion. Traffic jams and accidents involving alighting commuters are also common. Though chaos here seem to be self-regulatory, accidents are rare in this junction. Reason: The slow moving traffic and congested roads. There were eight accident cases in 2001, this rose to nine in 2002, falling to six in 2003 and rising again to eight in 2004 (updated till July 31, 2004). Several proposals are under consideration to further decongest this junction like diverting traffic into the narrow Mission Road. The Confederation of Indian Industry and BATF have jointly piloted a lane discipline project on JC Road under which violators face a spot fine of Rs 100. On JC Road, speeding vehicles brazenly cross the yellow line. A barricade must be erected. Buses stop right in the middle of the road, making it difficult for passengers to get off. Most processions begin from here, causing jams for hours. Those getting out of the maternity home have difficulty getting to the other side due to absence of signal lights at the Pehelwan junction. The noise is deafening. There must be some of restriction on the type of vehicles that can pass. Police are missing most of the time. Free turns only makes things difficult. However, after traffic has been diverted, traffic jams have been reduced. There must be more one ways. • Five years back, Sanjeev Salimath started out his business by catering around 20 plates of food to Kshema Technologies, a Bangalore-based IT company. Today he owns two hotels into which he has invested over Rs 20 lakh and is setting up another in Bangalore for Rs 10 lakh. • In 1987, Vishwanath V Katti invested Rs 50,000 in a security services business. Today his business turnover is over Rs 14 crore and has branches in Chennai, Hyderabad, Mysore and Hubli. He started his business with 100 people, providing security services to manufacturing companies. Today he employs over 4,000 people working for 325 companies. • SRS Travels’ MD Rajshekhar, who started his business with 10 vehicles, today owns over 300 vehicles, which ply for companies like Wipro, Infosys, and Dell. His monthly income from each vehicle is Rs 35,000. The IT industry in Bangalore has created millionaires not only within the industry but outside too. It has catalysed wealth creation in support bu-sinesses like catering, travel and security services as well. Catering as a business started only in 2001. Today over 300 caterers are making money by supplying to over 800 IT companies, says Mr Chandrashekhar Hebbar, President of Bangalore Hotelier’s Association. According to Mr Katti, “Ban-galore has over 80,000 security guards. Today, there is a short supply of people for this profession here.” With a growth of 35 per cent every year, the industry has been attracting agencies from Delhi, Chennai and Mum-bai to set up shops in Bangalore. Even Holland based Group-4 has started operations here. Travel agencies too are making hay. Over 3,000 vehicles operate just for IT companies. “There are over 10 large travel agents operating in Bangalore and over 50 small time travel agents do business with IT companies,” said Mr Rajshekhar. On the air travel front too, Bangalore has over taken Chennai in generating more revenues. “Domestic air travel has shown a 25 per cent growth this year and Bangalore is the third city after Mumbai and Delhi in generating revenues,” said Shravan Gupta, MD, Travel Air Pvt Ltd.
“These industries existed before. But after 2000, with more IT companies in Bangalo-re, they have seen huge growth and opportunities,” said Anant R Koppar, President, Mphasis Technologies. For Anil Kumar, who has been running his shop near Malleswaram Circle for the last 40 years, memories of the location’s cool environs with tree-lined avenues and the fragrance of sampige are hard to forget. However, things have changed now. The aesthetically designed traffic island has long been demolished to make way for the burgeoning vehicular traffic. 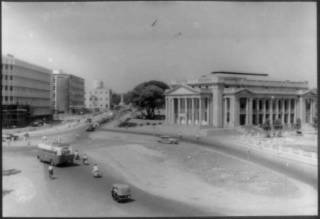 From one of the City’s secluded spots a few decades ago, Malleswaram Circle today has become the gateway to the Western and North Western parts of the City. The result: Maddening chaos and traffic snarls during peak hours. The junction, around two kms from the Bangalore main bus and railway station, serves as the nearest link to the densely populated new residential, commercial and industrial areas of Bangalore West - the main reason for the exponential increase in traffic flow. Two main roads intersect at the junction - Sampige Road and Mahakavi Kuvempu Road. Mofussil buses from the Bangalore outskirts ply via Malleswaram to reach K R Market and other parts of Central Bangalore adding to the traffic chaos. Moreover, there are a number of intersections on Sampige Road disrupting smooth flow of traffic and also leading to accidents. The junction near Sampige theatre is particularly dangerous as the flow of traffic from Srirampuram sector is heavy during peak hours. Motorists trying to take shortcuts through the various bylanes just add to the congestion. Moreover, there are three BMTC bus stands very close to Malleswaram Circle. There is little scope for road widening. The only way out - one-ways. Sampige Road, perhaps was one of the first four-lane roads in the City to be made one-way. The result of this experiment has been a new traffic bottleneck near Gitanjali Circle. The Pipeline Link Road, which serves as the parallel road to make up for the one-way on Sampige Road, is too narrow to accommodate the traffic. Deputy Commissioner of Police (Traffic-West Division) M T Naik says: “Presently all KSRTC buses towards Mangalore, Hassan and Tumkur ply via Malleswaram. The construction of satellite KSRTC bus stations at Yeshwanthpur and Mysore Road will lessen the traffic flow towards the junction”. Construction of a grade separator. Traffic diversion near Sampige junction and Gitanjali Circle. Parameshwara (advocate): Malleswaram still remains one of the green spots of the City. Road widening is ruled out as it will involve cutting down a large number of trees. The road linking Srirampuram and Sampige Road can be made one-way to reduce the traffic flow towards Malleswaram Circle. It is the increasing number of two wheelers that is causing the traffic snarls. An efficient public transport system will ease the problem. Metro rail should be of much help in this direction. Manjunath (Entrepreneur): The traffic problem is only during peak hours between 9 am and 11 am and again from 6 pm to 8 pm in the evening. I commute regularly via Malleswaram Circle to reach my factory only to end up in traffic jams. Buses could be diverted during these hours. Melkote Vairamudi (autodriver): Water logging is a major problem near Raja Mills leading to traffic jams and making the stretch between Sampige Road and Rajiv Gandhi Circle unmotorable every time it rains. Authorities should attend to the problem immediately. Ronald Rodrigues (shopkeeper): A traffic police should man the Malleswaram Grounds - Margosa Road junction. The junction has become a death trap for pedestrians. Movement of heavy vehicles should be diveted from the junction during peak hours. Bangalore: The State Cabinet is all set to clear the much delayed Rs.4,988 crore Bangalore Metro Rail project, which is considered as the only hope for tackling the traffic congestion of the burgeoning city. Chief Minister Dharam Singh who held a meeting with Chairman of Delhi Metro Railway Corporation (DMRC) R Sridharan on Thursday, later told media persons that the detailed project report submitted by DMRC had been sent to the Finance department for an appraisal and it would then be approved by the Cabinet clearing the decks for its implementation. The proposal would then be sent for the approval of Union Urban Development ministry seeking financial participation from the Centre and clearance for market borrowing, Dharam added. The share of State government and the Centre would be Rs.899 crore each and the balance would be met by market borrowing. The project will cost Rs.4988 crore including the escalation and interest, he added. The project report submitted way back in May, 2003 consists of 33 Kms of tracks in two corridors - East-West(18.1km) and North-West(14.9 Km), out of which 6.7 Km is underground. There will be 32 stations, roughly one per every Km. Initially 166 trains will run in each direction of each corridor every day at a frequency of 4 minutes during peak hours. There will be 3 coaches initially attached to every train which will be fully air-conditioned. The number of coaches would be increased later to 6. The project will be completed in 5 years in stages with commissioning of first stage of 7 Km in three and a half years. The speed of trains will be about 30 to 35 Km per hour against the bus speed of about 15 to 20 Km per hour. During construction around 9000 persons will be employed for 3 years and during operational maintenance phase, the staff strength will be around 1320. The provision of pedestrian underpass between Kempegowda bus stand and the City railway station, some years ago, has kept the roads free of jaywalkers, but the intensity of traffic has been increasing. The Khoday’s Circle, situated near the Divisional Railway office, is an interjunction of various arterial roads in the City with the traffic of Bangalore West, a densely populated residential, commercial and industrial area, passing through this circle. The Bangalore City railway station and Kempegowda bus stand, which encompasses city, state and inter-state bus stands is located close to the circle contributing to the traffic density. The Gubbi Thotadappa Road (also known as City Railway Station Road) which stretches from Cottonpet Circle (near Shanthala Silk House) to Khoday Circle, is perhaps the only road in Bangalore City which has three lanes. One of the lanes takes the flow of traffic from the Gubbi Thotadappa Road towards Bangalore West (Rajajinagar, Magadi Road and Vijayanagar), passing through the two-laned road underbridge. The middle lane of Gubbi Thotadappa Road takes the flow of traffic coming from Bangalore West and going towards Kempegowda bus-stand and Cottonpet. The third lane takes the flow of traffic towards Anand Rao Circle and to Seshadri Road. The Seshadri Road also has flow of traffic coming from Bangalore West side. The flow of traffic is smooth throughout the day except at peak hours. The traffic is intense from 10 am to 11.30 am and from 5 pm to 7.30 pm, leading to traffic jams around the circle. However, Mr M T Naik, Deputy Commissioner of Police (Traffic-West Division) says Khoday Circle is a well-designed traffic circle that ensures smooth flow of traffic. However, there is intensity of traffic with as many as 2.5 lakh vehicles moving during the peak hours in the morning and evening, he says. He says the construction work of a flyover at Modi junction and an underpass near Sujatha theatre on Dr Rajkumar Road and the consequent diversion of traffic has led to increase of traffic at Khoday junction. Besides, the road underbridge near the circle is narrow and needs to be widened. The Circle is monitored by traffic policemen, working in shifts from 6 am to 10 pm, he added. BMP also plans to extend to extend the ongoing grade separator near Sujatha theatre till Anand Rao Circle to decongest traffic in the entire stretch. If done, the existing bottleneck near Khoday circle will get cleared permanently, officials said. Widen the road under bridge near the circle. Synchronise the signal lights at all junction in Bangalore West. Extending Rajajinagar grade separator till Anand Rao circle. Construction of extra carriage way. Reducing the gradient of all roads leading towards the circle. Deccan Herald begins a new series, "Jammed Junctions" on putting high-traffic intersections in the city in order. First in the series is on the Magadi Road-Chord Road Junction. BMP officials are of the opinion that the bus stands could be shifted as all roads are narrow and already congested. It is one of the busiest junctions where policemen dread to man traffic during peak hours. Such is the maddening traffic that it has even rendered traffic signals ineffective. But believe it or not, over 10,000 vehicles pass through the Magadi Road-Chord Road junction every hour. In fact the time required for a motorist to wade through the flood of traffic here is over 180 seconds, which, according to traffic experts, is “too much a time taken.” Adding to the problem is the infrastructure which has remained the same since decades despite the steady increase in traffic flow. Also called the Vijayanagar Entrance, this junction connects two major roads - the West of Chord Road (Inner Ring Road) and Magadi Road. It also acts as the entry point for vehicles to reach the centre City from almost all areas in the southern part. While the movement of heavy vehicles has increased on Chord Road as it connects Mysore Road to Tumkur Road, Magadi Road is too narrow to accommodate the mounting traffic. Over and above, bad roads and uneven footpaths have only compounded the problem. To top it all, the junction has three Bangalore Metropolitan Transport Corporation (BMTC) bus stands, two petrol bunks, a temple and a marriage hall situated close to it. And traffic piles up when the BMTC buses jostle for space near the stop. “These have contributed significantly to the traffic jams. Since the temple is a sensitive issue, there is no question of initiating any action to either forcefully control the number of devotees or to shift the very temple. And it has been difficult to make the petrol bunk owners shift their base as they are very influential,” a traffic police constable, who wished to be anonymous, said. In fact, the civic agencyís plans to put an end to the chaos has also failed. Bangalore Mahanagara Palike, which had intended to re-design the junction and widen the existing roads, dropped the plan as there was no space available near the junction. Marriage halls, the temple and petrol bunks have been there for many years. “We should keep the junction free from all nuisance and traffic rules should be followed strictly. Besides, traffic flow can be made smooth only by a grade separator or a fly-over,” say officials. Shifting the existing bus-stands from near the junction. Strict enforcement of traffic rules. CHENNAI: While dismissing the charges on Bangalore losing investments due to infrastructure hurdles, director of Software Technology Parks in India-Bangalore, B V Naidu on Wednesday said that in the last five months alone 82 companies have come to Bangalore and the value of investment has touched around Rs.700 crore. There have been voices raised over infrastructure hurdles in the Bangalore city. The southern Region of CII had also recently said that Chennai has been the default beneficiary problems face by Bangalore and suggested implementation of a couple of projects to reduce congestion and spread the development more evenly across the state. However, the director of Software Technology Parks in India-Bangalore, B V Naidu said that Bangalore saw the entry of 82 companies in the last five months alone and out of this 52 were foreign firms. The value of investment had touched around Rs.700 crore (Rs.110 crore from foreign companies) in the last five months. "Infrastructure hurdles are there in every city. Whenever there is a problem/issue on infrastructure, government of Karnataka addresses it immediately. Bangalore Agenda Task Force, which comprises members from both the government and industry is looking at the issues relating to infrastructure. However, the government has allocated Rs.300 crore for the improvement of roads in Bangalore," secretary - IT, Biotechnology and Science and Technology M K Shankaralinge Gowda told here. Gowda also said that the government was in the process of implementing the IT corridor project to reduce congestion in the southern part of Bangalore. "This project will help reduce congestion and spread the IT development more evenly across the state, he said. He said that the Karnataka was planning to develop 10 new technology parks with a space of 15 million sq ft before March 2005. Three large companies had relocated to Bangalore from Chennai. PCS (Patni Computer Services), which was operating from Mumbai for the last 20 years, had set up a largest development centre in Bangalore, Naidu said. While referring to software exports, Naidu said that the state is targetting a growth of 35 per cent in software exports for this fiscal. "Watch out Bangalore, Chennai's here" says the Business Standard which a couple of weeks ago gave Bangalore, its newest epithet, 'Silicon Slum'. I am a little skeptical though, infrastructural superiority (which claim too is a little suspect) alone does not create an industry and certainly not a people-intensive one like information technology. Chennai is definitely a strong player in the bread and butter business of the Indian IT industry, software services, that too specifically in applications. But when it comes to stuff like chip design, embedded systems, networks etc. perhaps no other place in this part of the world has as much a talent base as Bangalore does. On another note, there is no way Bangalore can take any more growth. There is only so much of the road that can be widened and so many flyovers built. And its all fine to build expensive metro rails but how is one going to coax people who have own personal means of transport which gives them a doorstep to doorstep commute to give all that up? It will take a generation or two for a mindset change. And in the time that would elapse by then if Bangalore continues to grow at this rate, it would not resemble anything that is habitable. There needs to be a physical development. If the Government puts its mind to it, it can initiate planned development of the area around the upcoming international airport in Devanahalli. That has a good potential of becoming an effective counter magnet. This picture from the Deccan Herald narrates the nightmare that traffic in Bangalore has become. Bangalore: Will the seven weeks delay in release of other language films — upheld by the Karnataka government’s film panel — spell doom for Hindi movies in the state? With extensive piracy, particularly in Hindi, a film hardly hits the screen before it comes on the video market; so a seven-week delay will kill the market. Due to the delay, only ‘hit’ Hindi films — which are hardly a handful — will come to Karnataka, leading to a drastic shortage of supply for theatres that screen only Hindi. Result: Theatres will close down. Each distributor pays about Rs 15 lakh to Rs 20 lakh for the rights of a Hindi film; if the audience is reduced to a trickle, they won’t shell out this amount even for a hit Hindi film as returns will not be viable. So: No Hindi films will be screened in Karnataka. As a language film distributor put it: “Why should we do business in this state with this kind of restrictions and such high taxes? We can always go elsewhere, we don’t lose anything.’’ The situation is not just grim, but desperate for other language exhibitors and distributors. The problem is not just small theatres, but also the big, well-established ones. “Kannada films are not running, because the quality is bad. Two movies that were released last Friday have been taken off within a day, as the collection was that bad. If you don’t permit other language films, what are we supposed to screen?’’ an anxious exhibitor asked. As per industry statistics, there are 320 ‘A’ grade theatres in the state — 160 in Bangalore alone — which need to be given new releases every week. The Kannada industry produces about 100 films in a year, most of which run for a week, around 10-20 run for six weeks and hardly one or two for 100 days. With most new films themselves going through bad runs in theatres, there is no scope for re-runs, exhibitors said. There are no takers even for hit films like Kabhi Kushi Kabhi Gham or Kuch Kuch Hota Hai, because they have already been screened on TV. The South Western Railway has finalised plans for a Yeshwantpur Railway bypass on the Tumkur-Yeshwantpur route, which will cut down travel time of trains from the western parts of the State going eastwards by a good two hours. The bypass will be ready within the next six months and go a long way towards decongesting rail traffic in the Yeshwantpur railway station, which is fast emerging as the second terminal of Bangalore. For the past two years since the Yeshwantpur terminal was built, all trains going via Yeshwantpur and Yelahanka have had over three hours added to their travel time because an engine change has to take place at least once, sometimes twice. However, with the Hebbal-Banaswadi route thrown open now, engine turnaround has been spared at Yeshwantpur. Now a Yeshwantpur bypass has been proposed on the Yeshwantpur-Tumkur route, so that trains coming from the west — say Hubli or Mumbai and headed towards Yelahanka/Dharmavaram can go directly without touching Yeshwantpur at all. “We are in an advanced stage of acquiring land from the Air Force ahead of Yeshwantpur, which will enable us to build the track we need from Chikkabannavar to Yelahanka. What we need is only a 300-metre additional track. The project cost will be about Rs 50 lakh, while another Rs 6 crore is to be paid towards the land,” said Bangalore Divisional Railway Manager Mahesh Kumar. Mr Kumar told Deccan Herald that while the main advantage would be for goods trains, the railways will also consider diverting those trains “which do not require to stop at Yeshwantpur for commercial reasons” to bypass Yeshwantpur and go on towards Yelahanka. The plans are ready and work will begin in about three months, while it will take another three months to construct the short stretch of track. For trains starting from other parts of the State and connecting Yeshwantpur and Yelahanka, the problem till now has been that they would have to take an engine turnaround twice – each turnaround takes a minimum of 45 minutes but usually close to two hours because the adjoining track has to be empty to enable it. Considering there are at least five-six goods trains every day, which could avoid having to wait at Yeshwantpur, get line clearance and then chug towards Yelahanka with an engine reversal, it would enhance Yeshwantpur’s station capacity immediately. Yeshwantpur will now have the capacity to handle another 12-15 trains. A leading figure of the anti-outsourcing movement in the United States has warned American companies against sending jobs offshore saying by doing so they are firing their own customers. Lou Dobbs, a CNN commentator, who has become a leader of the anti-outsourcing movement, has a new theme in his new book: Look out, Silicon Valley! Bangalore is gaining on you! Warning US corporations who send jobs offshore, Dobbs said by doing so the companies were firing their own customers because American workers would eventually find themselves unable to purchase the goods and services being exported back to America by American companies. "Some folks in India believe that their country's version of Silicon Valley has already surpassed its California counterpart as a centre for high-tech employment," he writes. "American companies have been all too happy to answer India's siren call of educated English speakers willing to work at some of the world's lowest wages," he says. Dobbs' new book is titled: Exporting America. Linguistic Chauvinism, Parochialism And Protectionism touched a new high today with the Government appointed committee recommending a delayed release of all non-Kannada language films till after 7 weeks after their first release elsewhere in the country, a limit of only 6 prints per non-Kannada movie and an increase in the entertainment tax for such movies from 40% to 70%. Before they achieve financial bankruptcy the Kannada film industry has achieved mental bankruptcy. Why would any person in his right mind think these moves would get people to watch Kannada movies? If anything, it will push up piracy and television viewership. It points to the total bankruptcy of ideas in the industry that no one is even considering the possibility of making movies that appeal to the cinegoer. 70% of Kannada movies released this year have been remakes of other language films! Whenever an attempt has been made to produce good (but still mainstream) cinema, the crowds have never failed to patronize it. In the last 3-4 years, take the case of movies like America America, Amruthavarshini, Namoora Mandara Hoove, Janumada Jodi and some more. The solution being offered in no way addresses the problem at hand. When was the last time negative tactics helped any business survive? I will be surprised if someone doesn't move the courts over this move. But I won't be surprised if some "valiant saviours of Kannada" (read lumpen elements) decide to vandalize theatres that screen non-Kannada movies. Three months down the lane, if there is even the slightest increase in the theatrical revenues of Kannada films, I will concede this move made sense. BANGALORE: ‘We are sorry, flyover will be completed by 15th September 2004’. That’s the message the Bangalore Development Authority (BDA) has put up on boards around the Bangalore Dairy circle flyover. The construction of this on Hosur Road has been going on for almost two years now and its completion date has been regularly pushed back. As a result, chaos and confusion reigns. The fine dust kicked up is also causing heartburn for Kidwai and NIMHANS as some of their critical equipments and components are located close to the road. ‘‘The construction is going on for more than a year. We have seen BDA setting many deadlines for completion of the project, but only on paper. We are not able to ride on this road because of the heavy dust and rain has made the situation worse,’’ says Siddalingeshwar, a technician in Kidwai. Vishwakumar and Keshav Murthi, who also work in Kidwai say some medical equipment and air coolers have already packed up due to the heavy dust the road kicks up. Pedestrians complain that they are not able to cross the road as they are flooded with vehicles of all sizes and shapes all the time. “We use the path under the bridge to cross the roads, but the electric wires and other iron materials placed there makes it more difficult to cross,” says Suresh, who works nearby. The angry public also point to construction hours. ’’I think major construction work can be done at night and the road kept fully open at night. At least then, the peak hour traffic is not affected,’’ says Gopi Ragunath. The uneven road has made the ride more bumpy. Unlike other BDA construction sites, the UP State Bridge Building Corporation, which has got the contract here, has not asphalted or at least evened out the lanes that are in use. Often, the chassis of low floor buses get caught on the uneven surfaces. ‘‘It takes about half an hour to cover half a km and driving a bus is not an easy task,’’ says Ramesh, a BMTC bus driver. Police are also helpless in controlling traffic as vehicles queue up for a long time to pass this stretch. BDA PRO Anil Kumar said the authority has assured the Chief Minister that the flyover would be completed by September 15. ‘‘We are committed to it,’’ he added. A view of M.G.Road shopt from the Prestige Meridian building. One of the few good things about Bangalore that still remain - the greenery. This five-arm busy junction will soon see a flyover. The Bangalore City Corporation (BCC) in its efforts to decongest traffic has proposed yet another flyover now at Minerva Circle, one of the busiest junctions that connects the city and Bangalore South. Estimated at a total cost of Rs 14.41 crores, this project will involve two ramps, one on R V Road and the other on V V Puram Road (Sajjan Rao Circle Road) to merge over Minerva Circle and climb down on J C Road. The BCC's Engineer-inchief, Rame Gowda said: "The Consulting Engineering Services (CES) conducted a feasibility report in February on behalf of the BCC and the report has laid emphasis on the need for a flyover here. We have floated a tender in this connection and once it is through, the BCC council and the state government would take a call on it. The timeframe for the completion of project is 12 months from the date of commencement". He said this junction is one of the most crucial passages into the city for commuters residing in Jayanagar, Basavanagudi, Banashankari and J P Nagar areas. Traffic snarls are common here as the volume reaches around 16,242 PCU/hour during peak hours. Though J C Road was made one-way a couple of years ago things have not changed much. According to an origin and destination survey conducted by the CES, J C Road is the most commonly-used road. The five-armed intersection has R V Road, Fort Road, V V Puram Road, Basappa Circle Road, and J C Road meeting at this junction. Being in the immediate vicinity of the city market, J C Road is one of the important commercial roads of Bangalore. Added to this is the fact that this is a connecting road which makes traffic dense. Sensing the traffic sensitivity of this road, the city traffic police had even thought of making it a 'zero tolerance road'. The concept The major share of traffic flow during peak hours is along north-south which involves V V Puram Road and R V Road. The traffic flow at these hours is 5,348 PCU/hour, constituting 33 percent of the junction volume. So, the grade separation will be along this axis. "In all probability, we will go in for a three-lane unidirectional flyover along J C Road spanning over Minerva Circle and Bharath Junction with two-lane entry ramps on V V Puram and R V Road. The total length of the flyover would be 641 metres with a maximum width of 10 metres. The estimated cost of construction is Rs 9.93 crores, miscellaneous costs including land acquisition is estimated at Rs 3.98 crores and the cost of shifting utility lines is estimated at Rs 49.6 lakhs. Rame Gowda added that after the completion of the flyover the annual savings on fuel is estimated to be Rs 4.58 crores in the first year. On ensuring smooth traffic movement he said the construction of the flyover will be on for a year so the entire portion of the flyover would be barricaded and only 50 metres length near the junction will be kept open. Construction activity of the super structure at the obligatory span will be carried out during nights and a minimum clearance of five metres will be ensured. Artifacts from historical sites in and around Bangalore would be collected and showcased in the proposed Kempe Gowda Museum to be set up shortly by the Bangalore Mahanagara Palike. Speaking to reporters after visiting some historical sites in the City on the occasion of “Save City heritage” week, Mayor P R Ramesh said the Kempe Gowda Museum would be established at Mayo Hall and the existing BMP office would be shifted to Public Utility building shortly, he said. “Karnataka Historical Academy, Bangalore University and Kempe Gowda Academy, with help from the authorities of City temples and other places of worship, will collect artifacts, idols, Veeragallu and old manuscripts which will be kept at the museum,” the Mayor said. Bangalore City has gained international recognition and people visiting Bangalore should be made aware of the history of the City, he said. “The decision to move these historic artifacts to the museum would be taken up by the BMP after a high-level meeting and with permission from the State government,” the Mayor added. A number of monuments have been neglected in the City which needs to be preserved. Preservation and restoration of these historic monuments would be taken up soon, he said. The Mayor visited Someshwara Temple at Madivala, Someshwara Temple at Ulsoor and St Mary's Church in Shivajinagar besides Begur on Hosur road. An increasingly disturbing trend of the public turning their ire on the police over deaths in road accidents. There is only so much that the police can do when neither pedestrians nor motorists accord even a passing respect for traffic safety rules. Its also fueled by the fact that our (only) high-speed roads, the ring road, also has pedestrians crawling all over them. BANGALORE: After much discussion on managing Business and IT and BT, the focus now has shifted to managing environment and creating a pollution-free society. A day-long technical seminar ‘Planning, Planting and Management of Trees in Urban Areas’ conducted by the Arobiculture Association of India (AAI) on Wednesday deliberated on ways to effectively manage environment, especially, trees. The experts focussed on drawing a sustainable solution to avoid cutting trees for unwanted reasons. Delivering the inaugural address, Director of National Law School of India, Dr. A. Jayagovind said laws created must be implemented to effect results. Speaking on the occasion, Bangalore University vice-chancellor Dr M.S. Thimmappa said the University had launched ‘Bio Park’ project with the objective to protect existing flora and fauna in the campus and conserve rare and endangered species of Western Ghats. ‘‘As many as three lakh saplings of 300 different species were planted and they have grown into healthy trees,’’ he said. BANGALORE: To attract government’s attention to the growing civic problems in Bangalore, besides thanking the people who made a difference to improve the city’s infrastructure, a group of concerned citizens under the name, ‘Bangalore Cares’ are joining hands with candle lights at the Queen’s statue on Friday. Potholed roads, overflowing drains, half complete flyovers coupled with long, daily commuting and gridlocked traffic are some of the issues that need to be addressed, it said. ‘‘For one, we can sit up and take note when people do make a difference, by celebrating and saying thank you to government officers who have made a difference to Bangalore.’’ it said. The citizens’ group has urged all concerned to participate in the ‘Bangalore Cares’ to thank those who made a difference by attending the thanksgiving meet with candle lights. Bangalore: Power fluctuations — what’s that? This the question the man in charge of power supply for Bangalore asks. A question that speaks volumes about the city, which experienced two-hour shutdowns even last summer. But Bescom chief engineer (BMAZ) H.K. Kumaraswamy has grounds to speak with confidence on the quality of power supply now, as: “We hardly receive any complaints of low voltage or serious trouble from the city.’’ Even as Bangalore gets rather smug about its improved power status, The Times of India did a comparison of what the supply of power is like in other Indian cities and found several tip-offs for Bangalore. Mumbai: Quoted by all as the best example of power supply and infrastructure in India, Mumbai gets power from three private agencies: BEST, Tata Power Company and Reliance Energy (known as BSES till Reliance took over last year). The state-owned Maharashtra State Electricity Board caters to only a couple of suburbs. All suppliers generate power except BEST which buys power from Tata Power and sells it to consumers. Tata Power has a unique islanding system that snaps its grid off from the state’s supply the moment disturbances threaten to disrupt it. This has protected the suburban rail system from collapsing each time there is a frequency or voltage problem on the state grid. Reliance Energy also has such a system but has not been able to demonstrate its efficiency. But Mumbai, like Bangalore, has been prioritised in power supply so there is never any load-shedding here, though the rest of the state including IT hubs like Navi Mumbai and Pune suffer from this problem. The state is at least 1,000 MW short of power on any given day. Most power cuts in city are due to incidents such as tripping of a transmission line or transformer failure and these are usually localised events. Of late though, the suburbs are getting increasingly affected by blackouts that hit the western or state grid. New Delhi: Summer 2004 for Delhiites has been a horror story. Power cuts that lasted 12-18 hours, dips in frequency and poor redressal mechanism was punctuated by a weak distribution system and faulty billing. Two years after privatisation, the power sector in Delhi has seen some change with stable power supply. But unscheduled power cuts and long hours of breakdowns in certain areas have continued. The 29 lakh consumers in Delhi who provided power by companies Tata-owned North Delhi Power Limited (NDPL) and Reliance’s BSES. Though new technology in bill collection and metering standards have been introduced, Delhi residents are not happy with the existing conditions. Delhi loses all its points over power generation: The city only produces 17% of its own power demand as against Punjab (59%), Rajasthan (40%) and Uttar Pradesh (51%). So the city-state is heavily dependent on the vagaries of the Northern Grid. As for the industry, power-intensive ones have been made distinctively unwelcome in the capital. Kolkata: From being the city with the worst power infrastructure in the 1970s to one with the best since the mid-1980s, the transformation of Kolkata has been amazing. Today, the city boasts of arguably the best power availability. Power cuts are rare and occur only when breakdowns coincide with scheduled maintenance shutdown of plants. Since 99% of power is distributed through underground cables, fluctuations too are rare. The nearly century-old private sector power utility CESC Ltd generates nearly 1,000 MW — four-fifths of the power required by the city during the peak evening hours. The rest is supplied by West Bengal State Electricity Board (WBSEB). The satellite township Salt Lake that comprises the IT hub is serviced by WBSEB. “IT companies maintain a backup facility for comfort rather than need,’’ said PricewaterhouseCooper chairman Rathin Datta. The city has consistently received top ‘power’-ratings in all surveys over the last few years and remains one of the primary draws for businesses from other parts of the country. Hyderabad: The city does not suffer from even unscheduled power cuts. Neither is there frequent voltage fluctuation. There is interruption in the power supply only when the Central Power Distribution of AP Ltd (CPDCL) announces maintenance works in transformers or feeders. CPDCL has come up with a novel plan to number electricity poles that serve the customers. This helps in easy redressal of complaints This year, the CPDCL started lying underground cables, at a cost of about Rs 289 crore, in four reaches in the city. As for industrial supply, it has improved tremendously in the last five years. “When compared to cities like Bangalore, the supply is very good here. We use the generators in our Banjara Hills office only to keep it in running condition, as there is little to no use for it otherwise,’’ Sanjay Khendy, vice-president, Sierra Atlantic said. Chennai: The power situation in Tamil Nadu is probably the best in the country. A case in point is the agreement between Ford India Ltd and TN government. Ford operates in India without any provision for back-up power — no gensets or captive power plants. “We’ve been operating near Chennai for more than five years now. Till date, we’ve not encountered any power cuts at all. The quality of power is excellent. I can recall only one incident in the last five years, when there was a brief stoppage of electricity and that too because of a fire accident in the transmission station,’’ said Ford India Ltd spokesperson Vinay Piparsania. Unlike all the other metros, Chennai does not have a special agency to oversee its power requirements. The state-owned Tamil Nadu Electricity Board (TNEB) itself handles it as a routine part of its activities and ensures 24/7 supply. Bangalore: The IT capital of India — the tag automatically pre-supposes that Bangalore would have the best power supply in the country. But the problems that plague every IT hub — including US’ Silicon Valley and Singapore’s version of it, Suntec city — haunt Bangalore. Power supply is sacrosanct, costly and always outstripped by demand. But power scene is not all dismal — no frequent power trippings or fluctuations. Though more is to be done. With an average of six multinational companies setting up shop in Bangalore every week, the demand for power is undoubtedly heavy. The city is said to be growing at more than 10 per cent annually and load forecasts show that within five years, the present demand of 18 million units will double to 36 million per day. As it is, meeting the present demand is no easy task, given that some of the power cables are over 25 years old and use rather obsolete technology. According to conservative official estimates, the city needs about Rs 60 crore investment every year, if it is to keep up with the increasing demand. Karnataka’s power sector is severely cash-strapped and the distribution company for Bangalore city — Bescom — is saddled with low revenue areas like Kolar and Chitradurga. So, making provision for the kind of investment needed is a daunting task. “Even by Karnataka Power Transmission Corporation (KPTC) estimates, over Rs 800 crore is needed to set up sub-stations in the next two years,’’ Bescom managing director Bharat Lal Meena said. But perhaps all is not lost, as the will to act is apparent. Meena backs this assumption with figures: Bangalore’s power reliability index is 99.2 per cent — in other words, the number of interruptions in power supply is next to nothing. And power losses in the city are unbelievably low, even lesser than industrial Mecca, Mumbai: it is 11.3 per cent against Mumbai’s 11.75 per cent. The quality is set to improve even further as a Rs 338.28 crore package is being implemented in the city under the Centre’s accelerated power development and reforms programme. This money is being used to give Bangalore’s long suffering cables and distribution network a complete makeover — for the first time in 102 years! The oldest power cables in Bangalore on Sheshadri Road, Anand Rao Circle, Kumara Krupa Road, Sampangiramanagar, Cantonment station and MG Road are at least 25 years old. “These cables are insulated with paper impregnated lead, which results in very faulty supply. This kind of cable is not even made now,’’ Bescom officials admitted. Officials said that ideally, all cables should go underground and this will proof all lines from weather problems. “But the cost is prohibitive — we need Rs 10-12 lakh for 1 km of underground cable as against Rs 2 lakh for an overhead line. Even industry cannot compensate for this,’’ they admitted. This one really takes the cake. On the one hand, simply no efforts are being undertaken by the state to bridge the gap between demand and supply of electricity. And on the other, it penalizes those who generate their own power. The danger of flight of businesses from Karnataka may not be solely because of the lack of infrastructure. The state government’s taxation policy at various points for a business has weakened the local industry’s ability to fight competition from industries in other states. One of the most critical issues facing Karnataka’s industries is the tax on diesel used for captive power generation. The tax was effectively hiked to 20 per cent recently from the earlier 4 per cent. In addition to this, Karnataka’s industries have to pay an input tax on industrial products which currently stands at 4 per cent. “This is invariably multi-point in nature and has a cascading effect on the final cost of the product. The difference increases at every point of levy. Thus, if a final product has to go through two or three stages of manufacture before it becomes a finished good, there is a tax levy at each stage. This is a huge burden on the manufacturer and final consumer and retards industrial growth. As if adding insult to injury, the state has imposed a cess on industrial imputs which will amount to an additional levy of 0.6 per cent on costs,” said Venkatramani, a leading tax consultant. One more aspect that industries in the state are worried about is the taxes on hardware and software products. These are proposed to be subject to be taxed at 13.8 per cent, including cess. The State Government has assured the Kannada film industry that its demand to allow release of non-Kannada films in Karnataka only seven weeks after their release in their respective States will be considered. The Chief Minister, N. Dharam Singh, met Kannada matinee idol Rajkumar at the latter's residence and assured him that the K.P. Pandey Committee, formed to look into the demands of the film industry, would submit its recommendations by Monday. He wanted the industry members to maintain the status quo on the release of non-Kannada films till then. "The Government is for Kannada and its film industry. We know your problems, and I assure you we will look into them at the earliest. The release of non-Kannada films can be deferred till the committee submits its report on Monday," he said. A mob attacked the office of the Karnataka Film Chamber of Commerce (KFCC), a cinema and a film distributor's office here today. The police said about 50 people, said to be members of the Kannada Rakshana Vedike and the Samara Sene, carried out the attack in protest against the screening of films in languages other than Kannada. According to the police, around 11.30 a.m., the mob attacked the makeshift office of the KFCC in Gandhinagar. They damaged furniture and threw computers and typewriters out of the office. Later, the activists proceeded to Movieland cinema in the crowded Majestic area which was screening a Telugu film. They smashed the windowpanes of the cinema, damaged the furniture and ransacked the canteen. Two employees of the cinema were injured. This pretty much sums up the sorry state of this so-called city that I live in. The Karnataka Special Tax on Entry of Certain Goods Bill, 2004, awaiting the Governor's assent, is something that local bodies including corporations, city municipal corporations, and even gram panchayats will welcome with enthusiasm. They have long been denied the revenue source of octroi after it was abolished in 1978, and are forced to depend on the State Government for their meagre financial resources doled out from the Consolidated Fund. Although local bodies may collect profession tax, trade licence fees, advertisement fees, tolls, market fees, entertainment tax, property tax and such other levies, it is a fact that the Government has gradually wrested control over most revenue streams and administers them as a State subject. Those who have long argued that local bodies should not have to depend on the Government for revenue, see hope in the new Bill on Entry Tax. Official sources told The Hindu that the proposed Bill was, in many ways, the return of octroi in a new form. The Karnataka Special Tax on Entry of Certain Goods Bill, 2004, says, in the preamble, that the Entry of Goods Tax Act, 1979, which replaced octroi, covered only dealers and specified commodities and left out non-dealers. As the old Act covered only registered dealers and taxed only specified goods, substantial revenue was lost though the goods were consumed in a local area. The new legislation seeks to correct that position, it is stated. However, if the State Government does not specify and make over the entire collection of the new tax to the local government, it may be challenged before the High Court on constitutional grounds. The new tax will be easy to administer as the local body will depend on the Commercial Taxes Department, and there will be no additional manpower and administrative costs in collection of this tax. Administratively, the department will collect the tax at check-posts. The new tax will be revenue-buoyant as the tax base will constantly expand with rising prices or with inflow of goods from outside the State, giving the local body a buoyant tax revenue source. On a rough estimate, if the Bangalore Mahanagara Palike can expect to mop up an additional revenue of at least Rs. 100 crores annually from the new taxation measure, a gram panchayat can hope to see revenue collection of at least Rs. 1 lakh, which accounts for one-fifth of its annual budget. Sources said that even if the Government ended up losing hold on the local bodies, the entry tax on a variety of goods would act as a deterrent for buying goods from outside the State. Citizens can access all services provided by government and semi-government organisations at these portals. Fifteen locations have been identified across Bangalore city to house BangaloreOne portals which will provide a one-stop interface for citizens with State government and semi-government organisations. Scheduled to be launched by December this year, the portals will be a “one-stop-shop” where citizens can pay their water, telephone and electricity bills and commercial taxes, procure birth and death certificates, book railway tickets etc. The process of finalising the terms of reference and the tendering pro-cess for vendors is in progress and will be completed within a month, Additional Chief Secretary Vijay Gore told reporters here on Wednesday. The process of co-ordinating the various public utility providers is also in progress and the response has been positive, he said. Bankers ha-ve also shown tremendous interest in the project, he added. Based on the success story of a similar project in Andhra Pradesh, called eSeva, BangaloreOne deploys the tools of Information and Communication Technology (ICT) to enhance speed, certainty, transparency and efficiency in providing various government services to the citizens. Meanwhile, sources told Deccan Herald that the BangaloreOne centres will come up at Jayanagar 2nd Block, Yeshwanthpur Market Complex, Rajajinagar Shopping Complex, R T Nagar, Shantinagar, Malleswaram 18th Cross, Banashankari, Vijaynagar BDA Complex, HBR Layout, Tannery Road, J P Nagar, Airport Road and Nagarbhavi II Stage. Centres have also been planned at Madiwala, JC Road, MG Road and Fraser Town, the sources added. The National Institute of Smart Governance has been entrusted with the responsibility of conceptualisation of the project and provide consultancy while the state government will handle, among other things, site preparation, manpower deployment, training and co-ordination with the various departments. The state government, opting for the Public Private Partnership (PPP) model, has signed a MoU with Microsoft to provide technology to the Information Technology and Biotechnology Departments on the latest e-government framework based on its .NET technology. Microsoft will also assist the government in design, development and deployment of BangaloreOne. In response to Madhya Pradesh chief minister Uma Bharti’s request to expand operations to Madhya Pradesh, Wipro chairman Azim Premji has decided to send a team to Madhya Pradesh for assessing the infrastructure facilities before taking any decision. “Mr Premji promised us of sending a team, which will assess the situation there before taking a decision,” Bharti said, after an hour-long meeting with Premji at Wipro’s headquarters in Bangalore on Tuesday. Bharti added that her decision to showcase Madhya Pradesh to Wipro, especially Indore and Bhopal, came after Premji’’ recent announcement to expand the company’s operations beyond Bangalore. In fact, it was only when several other key personalities in the IT sector echoed Premji’s thoughts that chief minister N Dharam Singh decided to meet them and promise them of full support. According to Uma Bharti, her government has in store ‘unlimited’ land and good infrastructure for IT firms, besides the Indore and the Bhopal IT parks with state-of-the-art facilities. Bharti is in Bangalore along with a team from her ministry to project an ‘investor-friendly’ image. Discussions with Premji also included the options of expanding access to education in every district of MP. “He enquired about access to education for children in the state,” Bharti said. The recent outbursts from the IT community in Bangalore over poor infrastructure seems to have reached all corners of the country. Uma Bharti’s visit coincides with West Bengal IT minister Manab Mukherjee who is also on a similar mission. Mukherjee is accompanied by his IT secretary G D Gautama. This delegation is on a two-day road show to meet the heads of 15 top IT companies and showcase the state’s ‘intrinsic strengths’. The list includes Intel, SAP Labs, MphasiS, Texas Instruments and Max Healthscribe. Nandan Nilekani and Bangalore Agenda Task Force (BATF), which he helped found, have suddenly become ‘political’. They are at the centre of a public controversy. Sometime after the new Congress-Janata Dal (Secular) government came to power in Karnataka, BATF began dismantling itself. It had not heard from the government. But BATF had by now become a nationally-known institution. Other state governments expressed an interest in having their own versions of such a forum and the Delhi government went the furthest by signing an MoU with BATF to replicate it. When this perceived ‘neglect’ of BATF by the Karnataka government became a public issue, the government called leaders of the IT community and BATF members (Nilekani, as CEO of Infosys, wears both hats) for a meeting to discuss the city’s burgeoning infrastructure problems. Can you, objectively and in your own words, sum up what BATF has achieved? 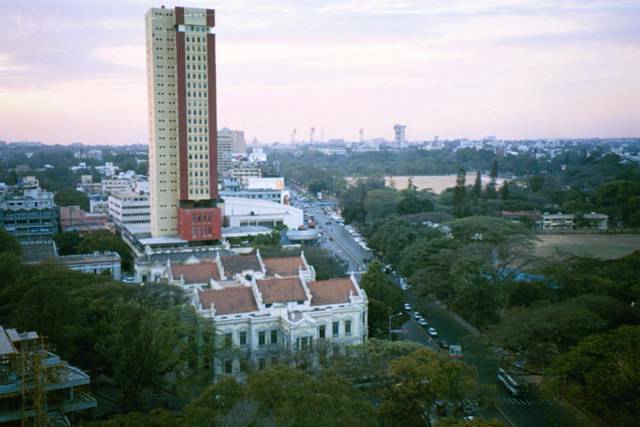 In the last five years, Bangalore has been the cradle of urban governance reform. It was really a platform for public private partnership which created a public accountability platform. This had not been done hitherto anywhere in the country where civic providers stand up every six months, talk about what they intend to do in the next six months, and then actually come back and say, we did this and we didn’t do this. The kind of transparency and accountability which was created with the BATF platform, the summit, is unprecedented. Second, we worked with several civic providers in the city and helped implement the self-assessment system that doubled property tax collection. We put in a fund-based accounting system (after the US government accounting standards which are the most rigorous), incorporating double entry book keeping, which produced financial statements shared with the citizens. So BATF helped bring in financial accounting and transparency in Bangalore Mahanagara Palike (BMP). Visitors to Bangalore notice those bright BATF bus stands. Yes, there have been many other initiatives – solid waste management, public toilets, urban spaces like bus stops, park rejuvenation. Then we partnered with agencies like the Bangalore Development Authority which, as you know, did a remarkable job over the last five years. These are all very tangible accomplishments. The Public Affairs Centre led by Dr Samuel Paul did a report card in 1999 and another in 2003. On every dimension the level of citizen satisfaction has gone up. Along with that, Ramesh Ramanathan started Janaagraha, a unique citizens’ participation movement, then a set of NGOs came together and set up the PROOF (Public Record on Operations and Finance) campaign. BMP has had eight of these PROOF sessions where they actually discussed the financial performance of the city. This is an important part of public accountability and transparency. How has BATF used IT? We have this whole initiative to implement IT in the city. Today all the property tax collected by the city is based on technology provided by the eGovernments Foundation (jointly funded by Nilekani and Srikanth Nadhamuni). In partnership with the BDA they are developing a digital CDP (comprehensive development plan), the only city in the country where such work is going on right now. These are all path breaking, innovative measures. With all this going for it, how has Bangalore landed itself in a civic mess? At the same time the city has grown dramatically. The success of the city, the influx of companies and people, influx of automobiles and two-wheelers, is also because the brand has become both nationally and internationally known. The thing with success is that it brings in more people. You moved in, Subir; like you many other people moved in. As a result, while there is a tremendous amount of stuff that has happened, it is always a moving target, the more you do, the more successful you are, the more it attracts people and you are back to square one. Some of the infrastructure things you have to see in that light. What is the unfinished agenda? We (BATF) had a summit early this year (January 31) and all the projects were listed. You can go and see it on the BATF website (www.blrforward.org). Finishing all the unfinished projects which have been publicly agreed to by all the stakeholders is really the number one priority. Leveraging all the tools that are there is also very important. We believe property tax collection can be enhanced by using IT and GIS (geographical information system). One lesson we have learnt from the last five years is that urban areas can largely stand on their own feet. The High Court came down heavily on the government for not doing enough to check air pollution. Castigating the Government for not initiating action to check vehicular pollution in Bangalore city, the Karnataka High Court on Tuesday directed the State government to phase out commercial vehicles aged above 15 years. While issuing a series of directions to the Government to protect the environment, the High Court has also directed the Government to introduce Compressed Natural Gas (CNG) as fuel for commercial vehicles (both goods and transport) in the city. A Division Bench comprising Chief Justice N K Jain and Justice V G Sabhahit also directed the government to evolve a scheme at the earliest, not later than 6 months, to phase out the old vehicles after giving sufficient time for the vehicle owners to replace their old vehicles. The bench has also asked the Government to give necessary breathing period for owners of transport and goods vehicles to convert their existing vehicles to CNG system. The Bench issued the directions while disposing of the petitions filed by Karnataka Lorry Owners’ Federation, which had questioned government’s notification (issued on November 13, 2002) banning entry of old vehicles, aged above 15 years, into the Bangalore city limit. It may be noted that the Transport department’s initiative to implement the new rules in 2002 faced opposition from truck owners across the State. The Government, therefore, evolved a new system to brand vehicles that are 15 years and above with red mark and to obstruct such vehicles from entering the city. However, the new rules remained only paper, while all vehicles, including those branded ones, continued to ply inside the city. Coming down heavily on the government for not implementing the directions issued by the court in 2000 to check air pollution, the judges said that the Court cannot be a mute spectator when the Government fails to discharge its duty. Holding that the government has necessary power to issue directions to check air pollution under the Environment Act and the Air Act, the judges said that protection of environment is the primary function of the Executive. Noticing that the impugned notification had lapsed by efflux of time as the Government failed to implement it, the judges felt that pollution in the City must have increased in the city during the past two years as the old vehicles, emitting toxic fumes, were allowed to enter the city. However, the bench directed the authorities concerned to ascertain the facts before taking necessary measures to curb vehicle pollution to ensure the welfare of the public. The judges have also directed the government to monitor all types of vehicles at important junctions to see that they do not violate the prescribed norms for reducing air pollution. Besides, the High Court has also directed the State to initiate steps to curb the menace of chaotic traffic in the city. Where are autos with tampered meters hiding?